Liberteen is a slab serif typeface created by Alexander Lubovenko and published by ParaType which comes in 6 styles working perfectly in extra large sizes. 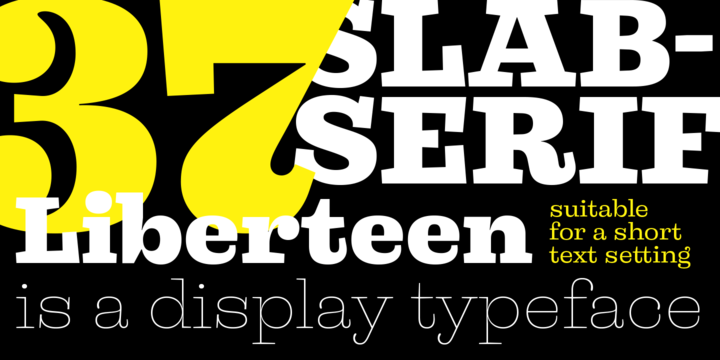 Also this display font is suitable for short text setting. It is a mix beetwen the elements of 19th century and a contemporary layout. Goes well on headline, logo, magazine, poster, text. Have fun! Price: starting from $40,00 for one font to $160,00 for all 6 fonts. A font description published on Saturday, October 24th, 2015 in Alexander Lubovenko, Fonts, ParaType by Alexandra that has 3,135 views.